On our recent trip to Charlotte, North Carolina, Doug and I were excited to see the blazing autumn colors as we drove past the trees and rolling hills. The last time we saw any trees so vibrant was the fall of 1978 - just as we were making our move to South Florida. We didn’t go to Charlotte just for the scenery; we were on a mission, of sorts. We’re trying to decide if the Upper South is a good fit for us. One big consideration for me is that there must be an Armenian community, and I already know that one exists in Charlotte. How do I know? Diane Gulkasian Tudor, a girl I knew from Sunday School in New Jersey, is the chair of the Parish Council at St. Sarkis Armenian Church in Charlotte. Since I also know Diane’s mother, Florence, and sister Joan, I contacted Diane to tell her of our visit. We tried to coordinate our trip with a church event, so we could get a feel for their Armenian community. 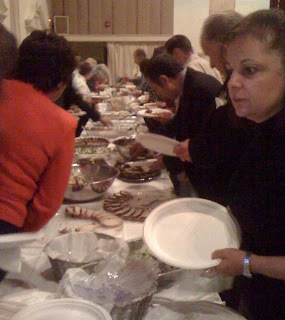 As luck would have it, there was a fundraising dinner at the Holy Trinity Greek Orthodox Church. The purpose of the event was to raise money for the International Orthodox Christian Charities (IOCC), which “offers emergency relief and development programs to those in need worldwide, without discrimination." For the buffet-style dinner, the Orthodox churches in the area provided an array of ethnic foods -- Armenian, Greek, Serbian, Ethiopian, Coptic -- after which was entertainment by Greek and Serbian dance groups. The dinner menu was as varied as it was delicious: avgolemono soup, sarma topped with pomegranate seeds, white bean salad, a fava bean dish that was to-die-for, rice with nuts, roast pork, fish, spicy chicken, baked chicken - too many items to mention - except dessert- an assortment of mini paklavas, homemade brownies, cakes, fruit; OK, I'll stop here since I'm running out of room. Doug and I sat at the “Armenian” table where we had a chance to chat about life in North Carolina. I have to say, everyone was gracious, and had a true love of Charlotte’s way of life. We only got a tiny taste of what it would be like as an Armenian in North Carolina, but what we experienced, we liked.